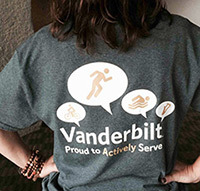 Team Vanderbilt was created to combine all Vanderbilt-sponsored walks, runs and rides in one place to make participation easier. This site enables us to promote participation for each event equally and not overwhelm employees with multiple requests. Contact: vanderbiltwalks@vanderbilt.edu if you have any questions. 3rd Ave N and Union St. Walks listed are sponsored by Vanderbilt University Medical Center and such organizations are approved charities. All solicitation activities must follow solicitation policy HR-039.